Homemade Crostini is a recipe I often made for a party or other gathering. Not only does crostini when made fresh taste wonderful, it is easy to make. For some reason in the grocery store crostini costs up to five dollars for a small bag of crostini, we can make a delicious appetizer at home for much less. I really love to entertain. It gives me a chance to try out new recipes and lets me hear what people think about a new dish I am trying. 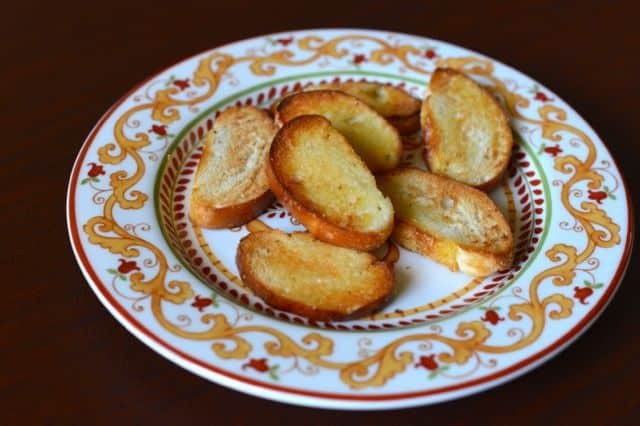 Crostini is simple bread sliced thin, that is drizzled with olive oil, seasoned if desired and tossed into the often for a few minutes. You wouldn’t think that this would cause high prices at the grocery store, but it can. When I make crostini I like to use day old bread, I can save a little extra money and since the bread is being toasted it really doesn’t matter if it is fresh and baked that morning. If there is no day old bread, I actually like sourdough the best. You can choose whatever you like best, the technique doesn’t change. You want to slice your bread thin, and then drizzle with olive oil, you could even use a little smear of butter. I sometimes choose one over the other depending what I am adding to the crostini when I serve it. You could even rub a clove or two of garlic over the bread before you add the olive oil, or top with a seasoned salt if you desire. Here are some recipes where I have used crostini so you can see what you can top your homemade crostini with. Crostini is the bases for so many appetizers. You can top crostini with many things. Slice bread into 1/4 to 3/8 inch slices, and place sliced bread onto a rimmed baking sheet. Drizzle half of the olive oil over the sliced bread. Use a pastry brush to brush out olive oil evenly. Season with salt and pepper if desired. Place into oven, the bread should brown in one to two minutes. Remove baking sheet from oven. Flip bread over, drizzle with remaining oil, and brush out olive oil evenly. Place baking sheet back into the oven and allow bread to brown, this should only take about one minute. Allow bread to cool completely before storing in an airtight container.